En Konsert For Fok Flest (the album) coming in April! Lykkepilgrim is unreal. What a marvellous piece of music! hmmmmm now what to indulge into first..... the documentary film I guess. 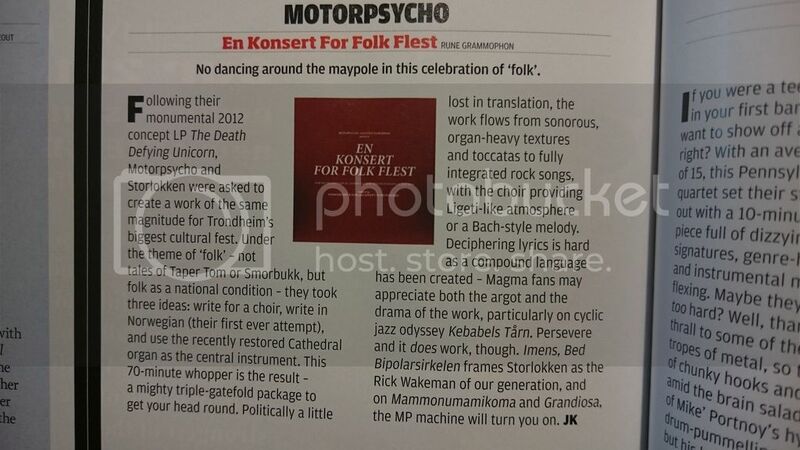 Excellent review from panorama.no - Motorpsycho vs. Einstürzende Neubauten. Finally got my copy today. Oh my, I'm especially impressed by Grandiosa (and I know it's the Norwegian God called 'pizza'), what a grand majestic piece of musicianship combined with delightful vocals! Will the album be released on Spotify? Would love to read this article, any chance of a translation made by some kind of soul? The online translation machines are too strange for me, feels like reading a bad translated manual of a toaster or something like that. The documentary is nothing but excellent! The second half of Lykkepilgrim has such a beautiful melody! Lovely! Trondheim trio tell Norway's politicians to take care when speaking on their behalf. This monumental work examining the nature of being Norwegian is presented in grand style: both on CD and double album. The performance, from last July, is also captured on DVD. A centre pocket inside the gatefold sleeve contains a detailed book on the ideas behind the concert and its execution. Norway's Motorpsycho are no strangers to the grand gesture. In 2012 they collaborated with organist/composer Ståle Storløkken on The Death Defying Unicorn at Oslo's Opera House. Folk Flest reunites them in their hometown Trondheim; augmented by strings and a choir for a work inspired by the concept of "most people". Norway's politicians bandy the term to gain support by appealing to the notion of most people. Motorpsycho rip this apart. This driving, intense and soaring piece is best appreciated as an entity apart from the psychedelically inclined Motorpsycho of late. I'm reviving this thread because I just ordred the album. I don't have a vinyl record player, but I see there's a CD and DVD included, so no problem there. Can't wait to get my hands on this - looks like a lovely boxset. Having already heard the album I know what to expect in that regard, and personally I think it's absolutely sublime. Definitely one of their best, IMHO. @JERO - I'm glad to hear you found your way into Magma. They are a band who, for me, extraordinary is a perfectly apt description. I first heard them about five or six years ago when a friend posted a live video of De Futura online. I was mesmerised and decided I had to hear more. I managed to get a very cheap copy of a double live album and listened to Theusz Hamtaahk. That night I could hardly sleep. I was tossing and turning, having feverish visions of dark, dank caves on alien planets and woke up sweating. Every time I closed my eyes, the wierd chanting in my head set off more uncomfortable subconscious reactions. After that I was hooked. What music could do this? Although I never had as visceral an experience again, I still have flashbacks and often find the music transporting me to unusual places. I have managed to see Magma three times since then and they are superb live - really worth checking out. They're back on tour later this year but I don't see any dates in NL. Perhaps you can make it to Brussels. I also highly recommend checking out albums by a Magma offshoot called One Shot. They have many of the musical elements of Magma, but no vocals and somewhat more fusion oriented. They only released a few albums about ten years ago, but they are fantastic. Thanx for that link, Punj, fun to watch! And I'll try to fulfill that adagium "every human should have seen Magma live at least once" in october Brussels. Today their boxset of 12 live cd's will arrive (that means I've allready spent my fun-budget for this month) and it's a perfect rainy day to further explore their stuff, while working on some of my paintings!Maybe this should have been filed under "Motorpsycho and..." but I now see the influence of Magma compositional structures on KFFF, which is certainly not a bad thing, so I posted within this thread. @JERO - I bought that live boxset last time I saw them. It's a real treasure trove. Have fun.